← Tweet All About It! Faces of Learning can help us understand how we learn. Everyone has a powerful learning story… what’s yours? The answer to this question could totally transform our classrooms and schools, and answering it is the mission of Faces of Learning. Revised Bloom’s Taxonomy provides a quality framework for teachers to use to ensure their content, the context in which they instruct, and assessments are aligned. 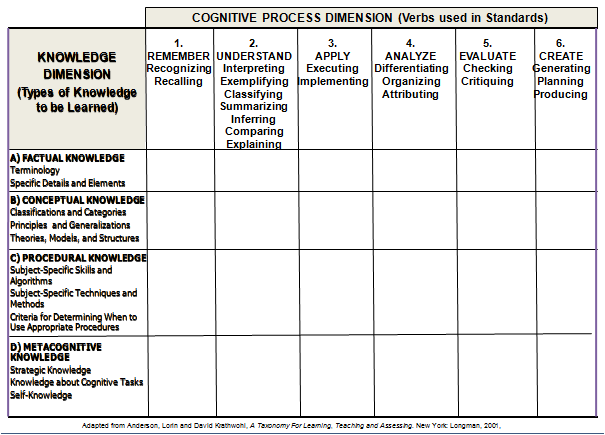 Revised Bloom’s Taxonomy is a two-dimensional model that takes into account the cognitive processes we expect students apply as well as the knowledge dimension that addresses that types of knowledge we expect students to learn – factual knowledge, conceptual knowledge, procedural knowledge, and metacognitive knowledge. Metacognitive knowledge includes strategic knowledge, knowledge about tasks, and self-knowledge — including what conditions are most conducive to the student’s learning needs. And now we get back to Faces of Learning. Completing the Learner Sketch will take 5-10 minutes and will provide you with infomration about how you learn. This site provides some great ideas teachers can use to help students understand themselves and their learning needs. Plus, teachers can gauge their own learning needs as well as what they can do to support student learning. Complete the interactive Learner Sketch to gain a clearer picture of how you learn. Read and watch others’ stories, or share your own. FoL provides a great place for you to learn more about yourself and your students as learners. Check it out!